Have had as many as 5 animals at a time being treated for foot rot over the last month. Near record dry May followed by near record wet early June then going dry again seems to have been the magic ticket. Have 3 in the sick lot right now. Checking every single animal on two farms every night trying to catch it as early as possible and running the lame ones through the chute is taking up all of my spare time. Had the first case at the 2nd farm Monday night with no animals moved there since April. Yearling heifer came up lame again last night 4 days after she finished 5 days in the sick pen getting treated every night. Not HHW, and they are on a good mineral. Farming is just like printing money! Talk to your vet and get a prescription for some aureomycin 100 crumbles. Mix them with your minerals. It will help prevent further problems. You’ll probably still have to treat the current problems. It can cost a lot. That discussion has occurred many times. Conclusion I have reached is that for a majority of producers they could make more as a Walmart Greeter. One must enjoy it to fo it. Foot Rot. I have not had it for 5 years. I use VitaFerm ConceptAid. I think it is partly a function of terrain. Fire Sweep has cows come down with it. Her soils have lots of sharp rocks. I have few rocks and clay soil. Steep terrain but easy on feet. JMJ Farms wrote: Talk to your vet and get a prescription for some aureomycin 100 crumbles. Mix them with your minerals. It will help prevent further problems. You’ll probably still have to treat the current problems. I don't like to put Lucky Pittman in this position so I will caveat this with the statement that I am taking all the risk for misstating his previous posts - but in the last foot rot discussion he said something to this effect - IF IT MAKES YOU FEEL BETTER USE AN ANTIBIOTIC BUT IT DOES NO GOOD FOR FOOT ROT. My apologies if I got that wrong. Without seeing the entire post, I don't know what the thoughts are, but last year I had a spooky cow come up lame with foot rot. By the time I got her penned she was limping worse than I liked. Over 8 days, she got 4 rounds of LA 200 before the limp stopped. I was out of Koppertox. I feel certain the antibiotic is what got her over it. I admit - I may be wrong in quoting him. It might have been another ailment. Hoof abscess... in my opinion, antibiotic treatment of any kind is not indicated, and probably completely ineffective. Any 'improvement' one might see from treating with antimicrobials is coincidental, and more likely... imaginary. Establishing drainage is the key. Be sure that your minerals or your soils have adequate iodine. My vet has always used & recommended LA300 on a mild case, Draxxin on a more severe case & Draxxin plus Sustain III boluses on chronic or situation where there is concern it may infect the bone. If I don't feel any debris between the toes or see a cut I'll just hand feed them Sustain in the pasture, clean it/Koppertox and quite often that does the trick. Dehydrated line around the drinking area seems to help a little in preventing it. jkwilson wrote: Have had as many as 5 animals at a time being treated for foot rot over the last month. Near record dry May followed by near record wet early June then going dry again seems to have been the magic ticket. Have 3 in the sick lot right now. Checking every single animal on two farms every night trying to catch it as early as possible and running the lame ones through the chute is taking up all of my spare time. Most of my life I ran cattle in arid or semi arid conditions and foot rot was a non issue. But in west central OK it is a problem. Over the last 4 years we have doctored 5-10 a year. I tried LA to start with but it didn’t seem to help some. Used Nuflor and it has always worked. Use Draxxin now as we keep it on hand and if it don’t work then I get some Nuflor and use it. I agree with Bright Raven that many times it is a bruise or cut caused by rocks. The pasture are rough and rocky. I have doctored 4 this year but think only 2 had foot rot. But when I am only there on weekends I take the cautious route. I feel it is better to give one shot just in case my diagnosis was wrong than to wait a week. I brought in a cow one Sunday and didn’t have anything to treat her with. Told the hired ha d to take her to the vet on Monday. The vet was gone but an assistant told him it was an ancestor and did nothing. When I got back on Sat she wouldn’t get up and hadn’t been to water for at least a day and the days were 100 degrees.Hauled water and feed to her. It was a large pen. Gave her a large shot of uflor. Talked to my vet and he said give her another shot the next week. She got ok. But a few more days and she would of been dead. The hired ha d was in the pen everyday but never. noticed anything. I do agree about an abscess. Was a horse shoer for years and treated several. Never gave antibiotics. But foot rot will get worse if not treated. I have seen it. kenny thomas wrote: Dehydrated line around the drinking area seems to help a little in preventing it. Kenny we have lots of ponds and it is worse in those pastures. Ebenezer wrote: Be sure that your minerals or your soils have adequate iodine. What he said. 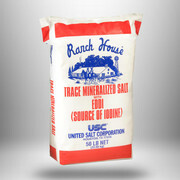 My father had always kept this salt out for his cattle (along with mineral, of course). A few years ago I thought "I never have any trouble with foot rot. I don't need to use that." So I started putting out plain white salt instead. Guess what? I started having trouble with foot rot. And it stopped when I went back to the EDDI salt. I've been there. Every day or two sorting out a couple more to treat. It can really take up a lot of time and make it hard to keep up on other things. Last time I had it really bad was when I got a dart gun. I had mixed results with the darts, but overall it saved a lot of time. Will have to do some looking but know I have never seen that product in this area. Will have to see what is available.